The True Time Traveling WM .·. Hopefully, we'll get lots of Bretheren to post their Lodge pics here. A little dark.....but I'm working on it.......The interior of my Lodge on the upper floor. Looking towards the WM chair. This is The Masonic Lodge in Geraldton. The Lodge was built around the 1930's and is constructed of sandstone, which is very common around here. It now has a Heritage listing by my State of WA. 32° Farenheit is certainly not higher than 3° Cel. Homo sum; humani nihil a me alienum puto. That really is a nice setting. Be nice to see a pic of inside. Not sure what the right word is. Yes, we have shingles on the roof. That is normal for most homes and many buildings here. Here's a photo of the inside and outside of our Masonic Temple. My Lodge (Spartan 70, the mother Lodge of the Temple) meets there. One other Lodge, and all the local appendant bodies meet in the Temple, too. That is a big building and very impressive. I like the inside also, but question........why the red carpet. ? I thought most Blue Lodges opted for "blue" carpet. I don't know. I've wondered myself, but never thought to ask. At least Esquire doesn't have to deal with dark green carpet like I do. We have blue flooring because we are the only ones to meet in out building besides the Stars. Now in one I visit often there color is red, because it is also the home to other bodies. 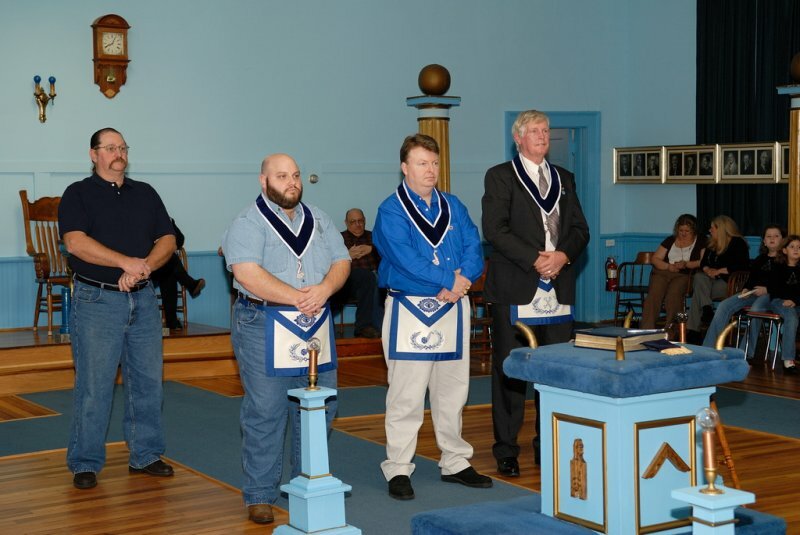 Well, the Scottish Rite is sometimes called "Red Masonry," so maybe that's why our carpet is red. The Scottish Rite had it installed. 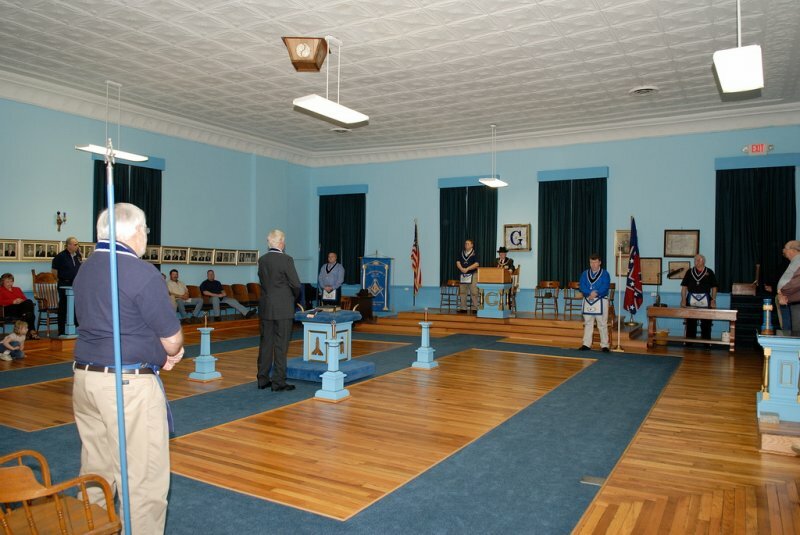 Here is an interior shot of Naval Lodge No. 87's Major Lodge room. We like our floor work. But I see no Mosaic Pavement. Our lodge room is very new to us like about 3 years now. Here is what it look like before. The brothers did a great job with this. I was not a member yet. But I was the last Brother voted on in our old lodge room and the first Brother Entered and Raised in our new lodge room. Chrism242, that is a beautiful Lodge. The big hall can seat a 200 or more people. But question, the windows are still open to the outside, how do you keep eavesdroppers from watching the Ritual? "He who would assume to govern others must first learn to govern himself." The windows are like what would put you in mind of shower glass so its really hard to see through however we have been looking into adding drapes. Bro.Bob Martin, I have never seen a better looking floor. They were definately true craftmans. I agree that hard wood floor is beautifull, I truly love the star. In Water there is Bacteria"
This is Cedarville 622 The Alter was hand made by one of brothers WB Chic Dyas years ago in the back of his Barbershop. There are lights around the columuns and stool. Unfortunely we no longer meet here. But the Alter is on display at a big city lodge. This is a view looking into the east. Our VOSL on the alter. This is a view coming in through the North West Side of the Lodge. Over looking evrything. I will send a couple more as soon as i get them up loaded. 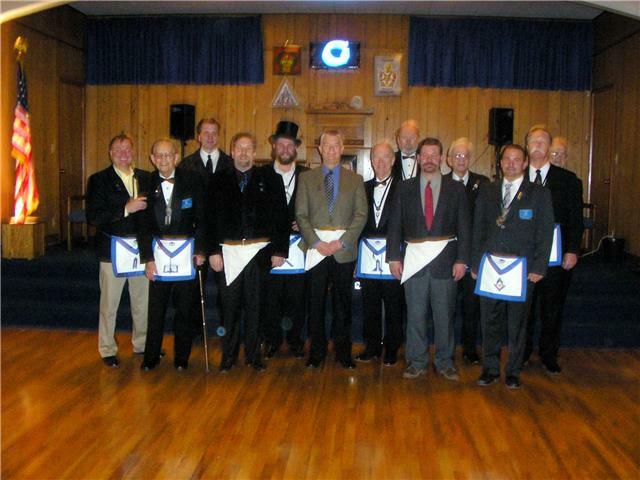 This is Patapsco Lodge # 183 line officers for 2009. Of Course there is me second row third from the left. Looking into the east from the West. Well this is my lodge. Hope your brothers like the pictures. Which one are you DD? I see three "apprentices" in the pic. red tie and somewhat scruffy... as a carpenter, I need balance my day to day with being and upright man... I'll get there. brothers tm247, chrism242 and stevep, luv the photos, as a collector and curator of masonic artifacts can any of you guys give me a close up photo of your masters chairs, luv the old style chairs and craftsmanship that went into them. We have a rehearsal next Tues..........so will try & take a few snaps and download them later. Interesting chair. About 80-90 years old? Not sure, DD, but will try and find out. I was guessing based on the WM name tags attached to the seat posts. Brother CAMB MASON, I would be honored to give you more pictures of the Alter that Worshipful Brother Charles (Chic ) Dyas built in the back of his little barber shop in the tiny town of Cedarville Ohio. I do know that 3 Grand Masters took there obligations at Grand Lodge on his alter. When I get off second shift I will take my camera to lodge. 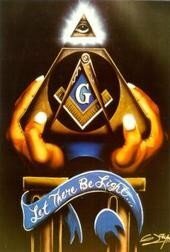 He was trully a great Mason and loved his lodge. I had the honor of sitting in lodge with him in his later years. He was trully awesome!! PS That alter in that room is where I took my obligation when I became in 2002 as Master of the lodge. I did some checking out this morning and "YES"....the're about 80-90 years old. They were made locally(here in Geraldton) and more so than not......handcrafted. Most of the furniture in my lodge appears to be of the same timber.......which....I don't know yet.....maybe Jarrah, which is a hardwood found here in Western Australia. I also found that the Wardens columns are handcrafted as are the 3 Columns within the Lodge. tm274 is Jarrah perhaps similar to our American Maple or Oak? good coloring over time. It's a very sturdy & hard timber, as you cannot drive a nail into it without predrilling before hand. It comes up a beautiful timber especially when varnished. I'll check for sure at our next meeting. We had jarrah floorboards in our old house - like slabs of iron; beautiful when polished though. 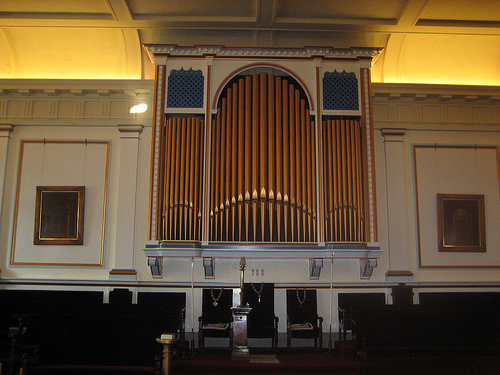 this is the south, organ loft. Very impressive building, nearly 100 years old and what an organ!! Have they any plans for a "big bash" when the 100 turns up? Hey I know that guy in the blue shirt!!! i like the blues, is that carpet, good idea if it is we have to do something with our floor in cambridge, maybe the way to go with runners. The Blue is water... So the Tide can......well u know.................. .......NOT!! ......yes Carpet it is. thats the way the floor was when the lodge first opened. they changed to all blue carpet in the late 80's then went back to the way the floor looks now just 3 years ago. Yep....you're right on with the money there. Below are the JW chair(mine for this year) and the SW chair. Columns are included also. Note the positions of the " Warden's columns". first time seeing those columns used, too bad we don't here in Mass., our lessor lights are placed on the floor in a triangle and only on the first. We have pedestals like yours tm but we also have lights on them as well. very nice furniture. Nope.........just the name of the Lodge........."Geraldton No.3". Will have another look next time I'm in Lodge. It looks a fairly new building and it has modern lighting, probably a/c too. Is that carpet or lino and it's it carpet........sure is a srange colour as I would expect Blue or Red...maybe green. As for the pics on the wall, we have ours in our Festive room. Good size Lodge, I will say. PS.........don't see anysigns of your Tracing Boards though.